It's always inspiring to attend a large student show with a diverse number of collections. Kwantlen Polytechnic University's The Show 2015 at the River Rock Casino Theatre in Richmond offered just that. 39 graduating fashion design students took to the runway with a wide range of target markets including menswear, womenswear, children's wear, maternity wear, sports wear and more. It was not possible to feature every student - so I picked a baker's dozen to feature in my show overview for Metro Living Zine (check it out by clicking HERE). I mined that same list to find students to cover in solo articles. As always, it's a mix of what I see on the runway, the availability of illustrations and honestly, just responding to the email and filling out the questionnaire. Over the years it's been surprising how many never followed through. It takes innate talent, excellent construction skills, an eye for good design and more than anything else, sheer drive to succeed in this tough industry. Responding quickly to my email is always a great sign that the new grad has what it takes and is motivated. When selecting solo articles, I also try to feature a mix target markets. In that vein, today I decided to include one dear to my heart - maternity. Wan's Pearl collection offered soft silhouettes, a lovely palette, comfortable and breathable bamboo fabric and a beautiful dyed ombre effect at the bottom of one dress (created with eco friendly logwood). These beautiful pieces are a far cry from the tent-shaped maternity wear I had available. And I love the thought put into the name of her collection. Want to why she chose Pearl? The answer is in the Q and A below. Without further ado - here is a look behind the scenes with fashion designer Amy Wan where she shares about her journey to this moment and the inspiration for her collection - Pearl. I was born in Shun De, China and my family immigrated to Canada in 2000. I grew up in Vancouver, B.C. I was a very active girl. I liked to play sports and spend time with my friends. During my quiet times, I liked to play with fabrics and sewing quickly became my hobby. Because of this hobby from a young age, I was strongly attracted to all the sewing classes that was offered in my high school including arts and crafts, pattern making and design. I still remember when I was young cutting up all the curtains in the house just to make garments for my dolls. My mother was really mad at me for a while, but she was also really glad that I found a hobby. It was really clear to me what I wanted to study after high school. However, I kept my opportunities open and tried different subject areas, such as liberal arts and business. But after a year, my strong interest in fashion drew me back to the path of studying design. I chose to study at Kwantlen because this school has a very good reputation for its fashion school. 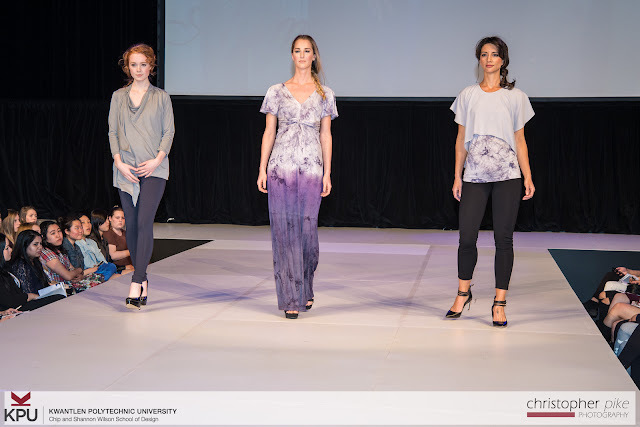 It is also the only school that offers a Bachelor Degree in Fashion in the Greater Vancouver area. My time in school was fun! I enjoyed every minute of it. There were many hard times and struggles to complete a project that satisfied the teacher's marking criteria as well as my expectations. I often reflected and reviewed my own performance after each project. Some of the questions that I often ask myself are - what have I learn through this project and what should I improve on for the next project. The inspiration for my grad collection was babies. When I look at them, I often think of all the hard times as well as the happy times that a mother goes through during her pregnancy. This inspired me to create something not only fashionable, but also functional and comfortable so the mother can still be as fabulous as she was before and will be again after pregnancy. Each garment is transitional and can be worn as nursing garments after the baby is born. The theme of the collection is “Pearl.” Pearls are embedded and grown in the lining of shells known as the “mother of pearls”. Both mother of pearls and pearls symbolize purity, generosity, integrity, and the loyalty of its wearer. A mother also shares characteristics of the mother of pearl. They hold the strength and will to weather the elements while keeping what’s most precious to them safe, the baby. There is hidden beauty here that I respect and tried to capture in my collection. With soothing, neutral colors on the outside and beautiful highlights on the inside, it complements the hidden strength and beauty that only a pregnant women has. 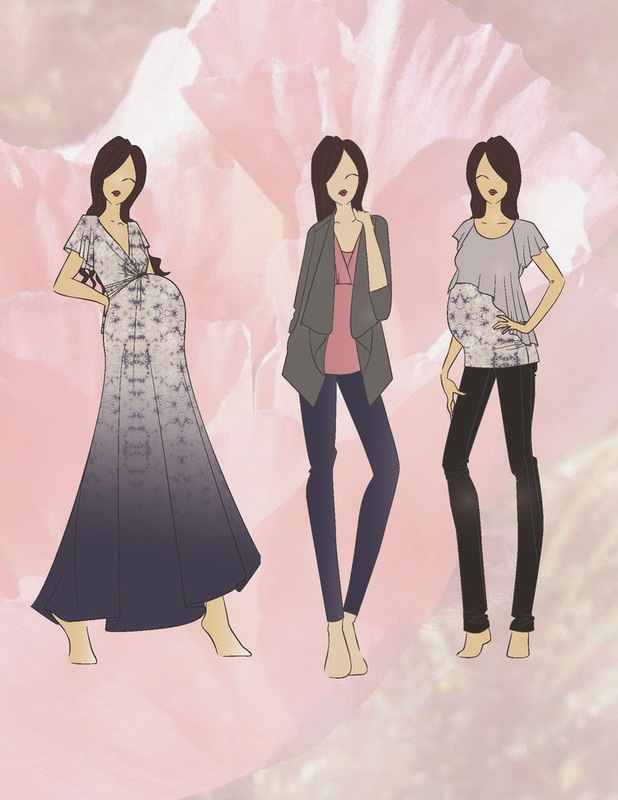 Aymee is a stylish maternity wear line that can transition into nursing wear. The collection is designed for mothers who value quality and functionality. The palette has a soft and soothing feel to it. The fabric used is mainlyBamboo Jersey because of it soft and breathable texture. I love my collection. If I really have to choose a look. The Grace Dress would be my favorite look. I used a natural dye - logwood - to get the ombre effect accenting the bottom of this dress. It was inspired by the shadow of a pearl. Where do you go from here – are you going to work for others for a while, launch your own line, take a break and travel? Take a break from school and start working towards my goals in life. Please share a quote on what fashion means to you. To contact Amy Wan or see more of her work, please visit her website at amy-wan.com.